Pathologically liver cirrhosis is divided into micronodular and macronodular. Micronodular cirrhosis is characterized by the present of less than 3 mm of uniform nodules. Macronodular cirrhosis is characterized by the present of more than 3 mm of irregular nodules as a result of division of the liver by fibrous band. Histological studies may reveal nodular regeneration with disruption of the normal architecture of the liver and diffuse fibrosis of the liver. There is also an reorganization of the vasculature of the liver/hepatic system. Alcoholism and genetically inherited disorder such as Wilson’s disease and hemochromatosis may lead to micronodular form of cirrhosis. 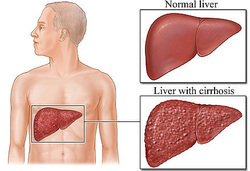 Macronodular form of cirrhosis is mostly associated with progression of alcohol inducing micronodular cirrhosis, hepatitis B virus, biliary cirrhosis, drug related hepatitis, hepatitis C virus alpha 1 antitrypsin deficiency and Wilson’s disease. Cirrhosis may lead to destruction of the liver which cause and increase in the portal venous pressure. This will finally lead to hypoalbuminemia ( decreased in plasma oncotic pressure) and further leads to ascites and peripheral edema. Aldosterone hormone may undergo degradation process in cirrhosis. Cirrhotic patient present with symptoms and signs such as edematous ankle, loss of weight, loss of sexual hair, fetor hepaticus ( corpse smelling breath), coarse hand tremor ( asterixis), atrophy of the testicles, muscle cramps, spider nevi/capillary telangiectasia of the face, jaundice and vomiting as well as anemic. It is advisable for the patient with cirrhosis to abstinence from alcohol intake, consider vitamin ( fat soluble vitamin) supplement and restriction of sodium intake. This is done to avoid any complication such as hepatorenal syndrome, hepatic encephalopathy and hepatocellular carcinoma. Ammonia may act as neurotoxin which lead to hepatic encephalopathy. Laboratory investigation may reveal high level of ammonia in the blood, increase liver enzyme such as ALP, AST and ALT, hyperbilirubinemia and hypoalbuminemia as well as prolonged in prothrombin time ( PT ) as a result of deficiency in coagulation factor. 1.Schuppan, Detlef, and Nezam H Afdhal. “Liver Cirrhosis.” The Lancet 371, no. 9615 (March 2008): 838–851. doi:10.1016/S0140-6736(08)60383-9. 2.Ohtomo, K, Y Itai, Y Ohtomo, J Shiga, and M Iio. “Regenerating Nodules of Liver Cirrhosis: MR Imaging with Pathologic Correlation.” American Journal of Roentgenology 154, no. 3 (March 1990): 505–507. doi:10.2214/ajr.154.3.2154911.